How Risky Is Domino's Pizza Inc.'s Stock? Two ways investors could get burned by biting into shares at this hot price. 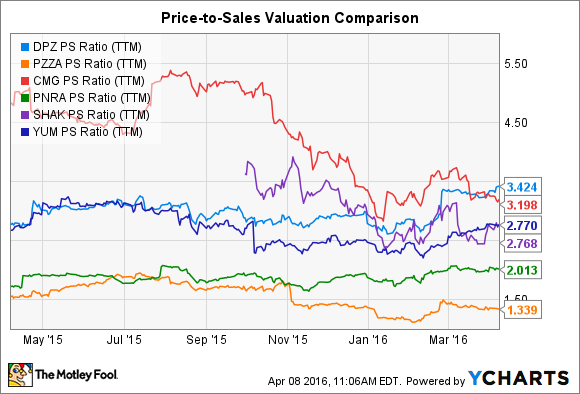 As far as business models go, Domino's Pizza (NYSE:DPZ) looks about as safe as an investor is likely to find. The chain sells one of the world's most broadly popular foods -- one that is as easy to assemble as it is cheap to produce. Domino's sits on top of a $33 billion pizza delivery industry, which gives it economies of scale and critical brand recognition to help it cut through a sea of competitive noise. Meanwhile, its franchised setup -- where less than 10% of stores are company-owned -- minimizes risk to the corporation while maximizing profits. Domino's 9% profit margin is almost double Papa John's (NASDAQ:PZZA) and Panera Bread's while approaching ultra-efficient Chipotle's (NYSE:CMG) 11%. 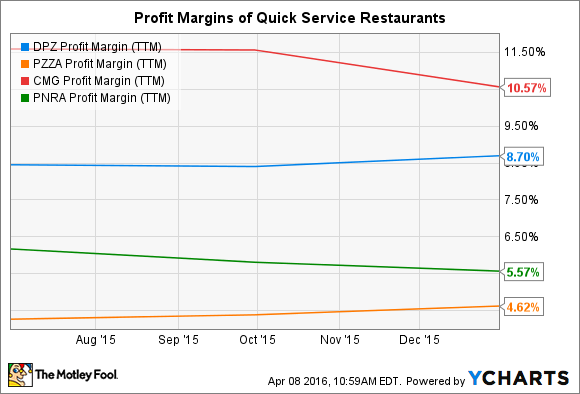 DPZ Profit Margin (TTM) data by YCharts. A business with those kinds of competitive advantages isn't going anywhere. Americans will likely be eating many more slices of Domino's pizza a decade from now (probably delivered by robots) than they do today. But that doesn't mean the stock is a safe bet. Below, I'll highlight two of the biggest risks that investors take on by owning Domino's shares right now. The main risk to buying a high-performing business like Domino's is in paying too high a price. Investors wanting a piece of this pizza giant clearly face that prospect given that the stock is up almost 700% in the last five years. To own shares now you'll have to pay a significant premium over just about any comparable operation. On a price-to-earnings basis, Domino's 40 P/E trounces Papa John's 29 and Chipotle's 30. Sure, you could argue that Domino's has earned that premium. Its comps soared 11% last quarter -- following an 11% boost in the prior-year period, after all (Papa John's just inched up by 2%). Still, the fact that its stock valuation is so far ahead of peers heightens the risk of sub-par returns from here. Investors are also exposed to the risk that Domino's operating results turn lower. This is a concern for any business, but seems greater in this case because it's not clear exactly why the company is outgrowing the industry by such a wide margin right now. CEO Patrick Doyle addressed this mystery in his latest conference call, saying "If there is one question I continue to get from the many who have become interested in us in recent years, it's about the cause of our success and what catalyst or event we can point to to explain it." At the end of the day, Domino's is selling the same combination of dough, sauce, and toppings, while enjoying the same operating efficiencies as national rivals including Pizza Hut, Papa John's, and Little Caesars. Yes, it has improved food quality and added popular innovations to the menu while at the same time investing in store remodels and finding great success in the e-commerce channel. But those are all strategies that competitors can, and eventually will, mimic. Domino's is executing far better than its rivals these days. But why should that market dominance stretch on through the next five years?